The hats are sold out, I'm trying to get more. I was initially going to install it myself, but I ran out of time. I ended up buying it from Fiberine and having a 3rd party install it. The 3rd party has asked that I don't mention who they are, but they did a great job. We did film a few videos around that time. We're playing catch-up right now. I'm betting they'll be live in 3 weeks or so. I'd love to have one if you end up getting more. 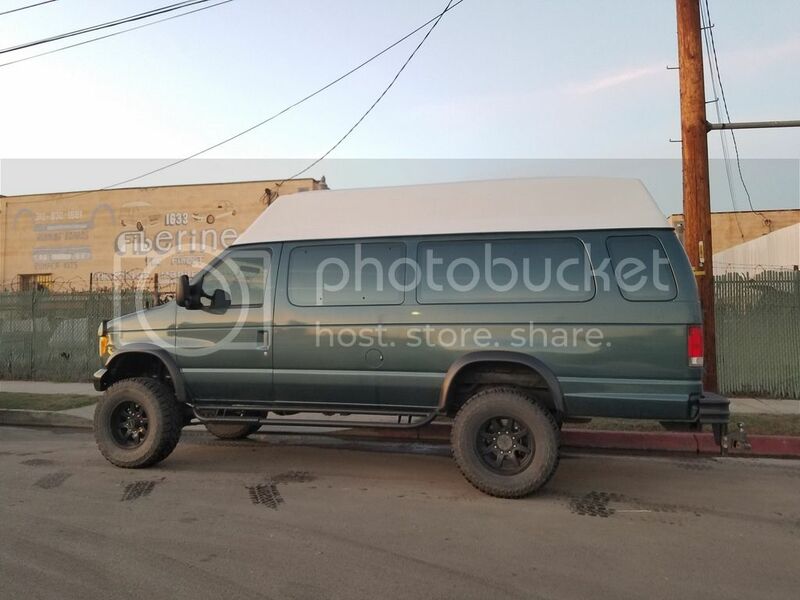 I have my Fiberine top now just trying to finish a roof rack before final install on the van but would love to see some footage of yours when your done editing and have them up so i'll check back and keep and eye out. Thanks! Very nice, any plans for Windows in the top? Is it just coincidental that the side of the building says "Fiberine" on it? Well... we were thinking of selling this to get a transit, but there are a few issues. 3) Fred is awesome, and he'll go places no transit can go. Yeah yeah, I know I'm late, but I wanted to make sure the info was here in case others were looking for it too. #1 7100lbs towing, 4500lbs payload seems pretty dang good for a Transit. Compare with an E350 at 7300-9700lbs towing (from the data I've seen so far), and maybe similar payload(the data has vanished from my sources and BodyBuilder doesn't show it for the diesels). #3 Fred is indeed awesome. It'll be interesting to see how well a proper Transit 4x4 does in mud and snow, being ~1000lbs lighter than an E350(curb weight). Sweet thank you, that is super helpful!! Well, our trailer has a gvwr of 8800 lbs, so a transit is out of the question for us. It may be a great option for some, but it would require us to downsize our house too much. So for us, Fred is the perfect van. I have no doubt that MGmetalworks will build a sweet transit one day. They'll be a great option for a lot of people. Even the dually 3500 sprinters Max out at 7500 lbs, so those aren't an option for us either. I haven't been able to find the towing capacity data for Fred. One link said 10,000lbs--is that correct? Very nice rig, ours is similar. Our's is a 97 and no diesel, but same color. That's max, with an empty van. Van looks sweet! I really like the high top. I'm curious about the total combined weight, when you get it fully loaded for the trip that is. The pic with the airstream makes me cringe, not a relaxing way to travel (for me) and wouldn't get any better with a transit that's for sure. I've seen way to many of these setups (no not e350 vans specifically) in yard sale configuration all over the freeway. Your van looks great. Mine is an RB and I love the high-top, makes a lot of difference. Makes it so much more usable.